The widespread proliferation of mobile devices puts unprecedented computing power and information at the fingertips of individuals throughout an organization. While offering advantages to both the enterprise as well as staff, IT shops struggle to deploy consistent controls across an array of varying software and device types. 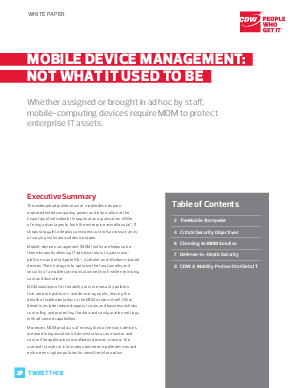 Mobile-device management (MDM) software helps solve these issues by allowing IT administrators to gain cross-platform control of Apple iOS-, Android- and Windows-based devices. The strategy is to optimize the functionality and security of a mobile communication network while minimizing cost and downtime.